As the Executive Director of the Cambodian Civil Society Partnership (CCSP), Sokhany Prak has led CCSP since 2009 where she formerly hosted the Working Group for Partnerships in Decentralization (WGPD) Secretariat. 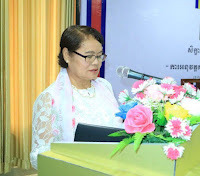 She started her career as a teacher in Battambang province and has more than 20 years of experience working in international organizations on development work, gender, democratic development and governance issues including with UNDP, USAID, Australian Catholic Relief (Caritas Australia), and JICA. She has promoted democratic development and good governance through supporting commune and district councilors as well as local authorities at sub-national level to be more capable of serving people in the community. Sokhany was one of the nominees for the One Thousand Women Noble Peace Prize in 2005 and was one of only seven Cambodian women nominated for their dedicated peace building efforts in post conflict period. Sokhany wants to see women in leadership positions, playing a major role in building society and becoming role models for other women.